These egg free muffins really are fantastic. They are easy to make, store really well and are versatile. This particular recipe is a great way to use up bananas that are close to turning, but do not wait until they start to go brown. Usually, these are too ripe to make good egg less muffins. Grease 12 muffin tin or a large bread loaf pan. Blend the bananas and add the milk and vanilla. Mix the margarine or butter and sugar and add to the banana mix. Combine this wet batter with the flour and baking soda. Pour the batter into the muffin tin or bread loaf. Bake them for about 10-12 minutes if cooking the muffins or for 45-60 minutes for bread. Test by inserting a toothpick into the centre, if it comes out clean the bread of muffins are cooked. Let them cool on a wire rack. Store them in an airtight tub. They freeze well, but the texture changes when you freeze them. Some people add dried fruit to this egg-less muffin recipe, but personally, I only like it with dates which have been finely chopped. I have heard of people using coconut oil instead of butter or margarine, but I did not have much success with this approach. 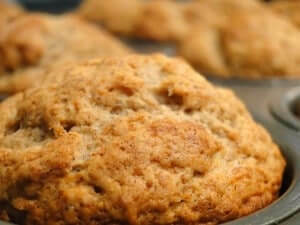 If you want more flavour combinations for muffins, check this link out. Most of them should work well with this muffin batter, just be careful about how much moisture you are adding. If the batter looks thinner than normal sprinkle in some more flour and make yourself an extra one.